The cover dress is a remake of a vintage dress by Connie Palmer. Along with that, we have garments for all sizes for the holiday season. 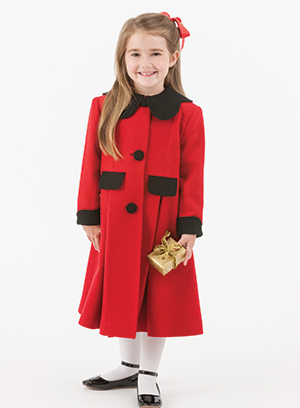 Gail Doane has shared a traditional classic—Royal Princess Coat—which will delight young ladies with its princess lines. Baby Jack is a pleated romper that is adorable for little boys. Your little chap will look fabulous in this for the holidays. Martha Pullen shares her one of her favorite antique dresses and its history. 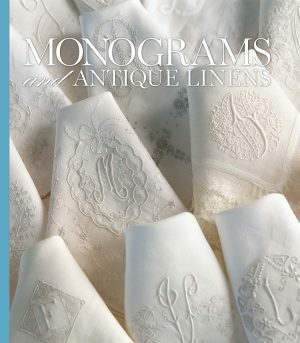 A visit with Debbie Glenn is featured, celebrating her legacy of sewing patterns and designs. 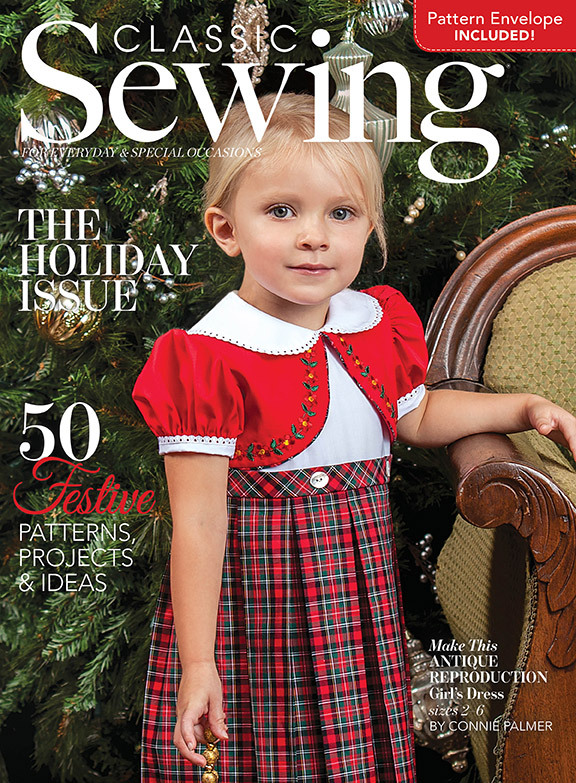 Our featured shop this issue is the Smocking Bird in Homewood, Alabama, where sewists have shopped for three generations. 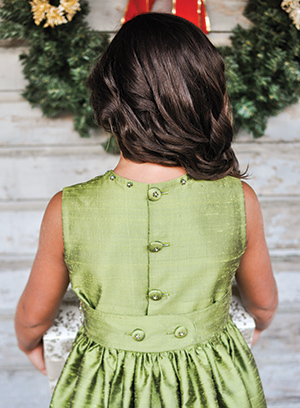 Andie, a pattern from Farmhouse Fabrics, is a dress for sizes 2–16 that is so versatile. You can take this pattern and make a dressy outfit or a wonderful casual dress. 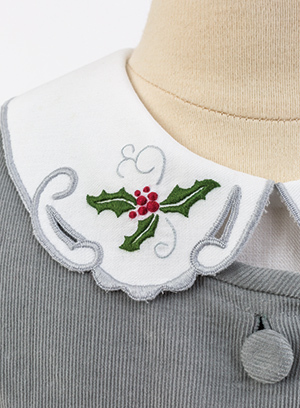 Christmas smocking designs are plentiful for all sizes, along with appliqué designs you will love. The smocked holiday muff is a showstopper. 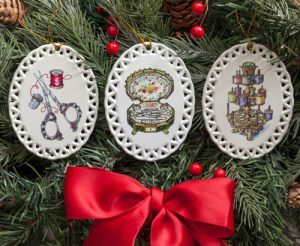 It will be your favorite for the holidays to give or to keep. It you have wanted to learn more about working with English netting and silk, there are great articles giving you valuable information. Sydnee Watson’s jacket inspires us to sew for ourselves and create our own fashion. 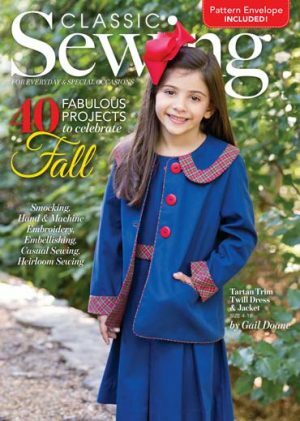 When you get this issue, it will be like opening a box of sewing presents! 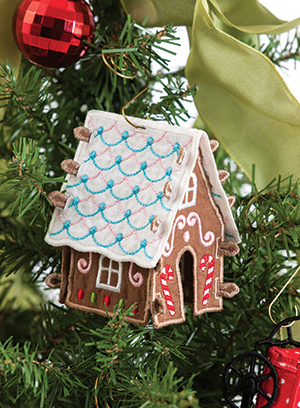 Lots of downloads, embroidery designs, and patterns for your holiday sewing await!